Another reviewer had bought the Accuphase E-470, so I ended up reviewing the lower model, the E-370 which is a 100-watter integrated amplifier. Victor Pheh of Hi-Fi Creations Trading delivered the E-370 to my house and it took the two of us to carry it from the boot of his car. Accuphase products are heavy and very well made. Press a button and the panel below the two meters will flip down slowly to reveal lots of buttons. At first glance you will be reminded of a Luxman amplifier from the 1970s. 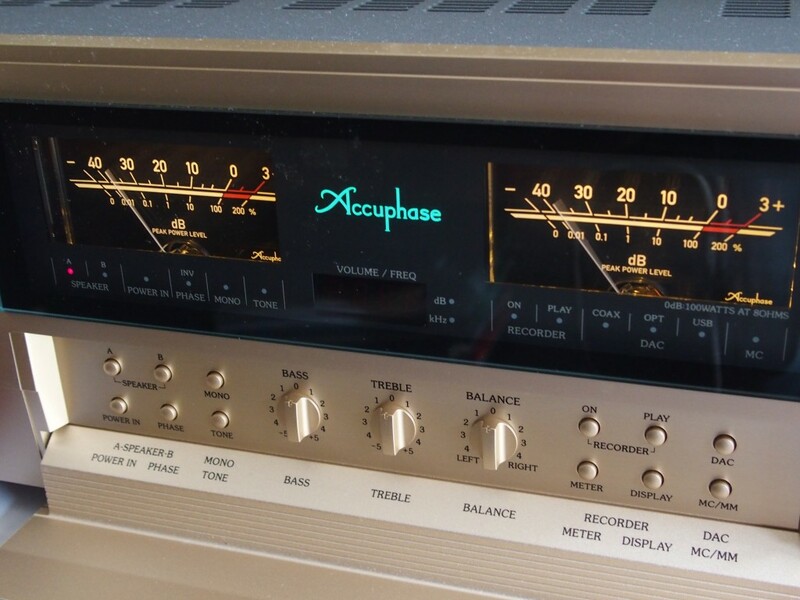 The meters give the Accuphase a retro but classy look and you will need to read the manual thoroughly to learn all the functions of the numerous buttons and switches. The matt gold colour gives it a luxurious sheen and the remote control, which is also in gold, looks like it is made from a solid block of aluminium which adds to the elegance of the Accuphase. The Accuphase E-370 integrated amplifier looks classy. The panel below the meters flip downwards to reveal lots of switches and knobs. For the review, I used the YS Audio Encore CD transport paired with the Wyred4Sound DAC2 and WyWires Platinum and Diamond RCA interconnects (in for review) and Oyaide QAC-212R XLR interconnects (which use Hitachi copper). Speaker cables were the Kimber 12TC connected to the resident ATC SCM50 floorstanders. For the heck of it, I also used vintage Western Electric tinned copper wires as speaker cables. 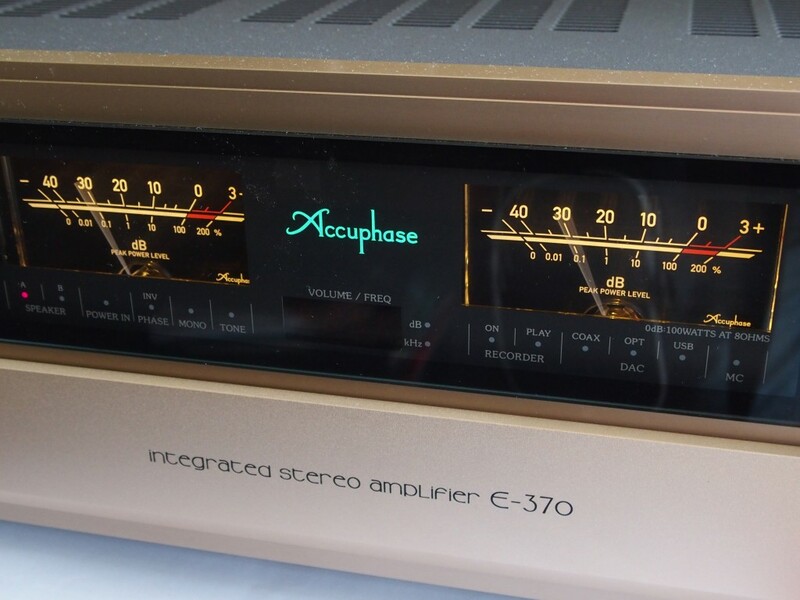 The Accuphase E-370 integrated amplifier is a Class AB design and while it has the punch of a Class AB design, it has the smooth and organic qualities of a Class A design (found in the flagship integrated amplifier E-650). I found the Accuphase E-370 a bit fussy about power cords and interconnects. I was playing the song Brand New World from the At The End Of Paths Taken album by Cowboy Junkies and the bass lines can be boomy and loose if they are not well controlled by the amplifier. It sounded boomy and loose with the Accuphase E-370 when I was using a DIY power cord and the Oyaide XLR cable. The bass was better controlled when I switched to the RCA inputs plugged with the WyWires Platinum and Diamond interconnects. So I changed the power cords and obtained another XLR cable – the Gotham – to tinker with. Using a Kimber PK-10 power cord with the Oyaide XLR interconnect, the bass became overpowering. Using the Siltech SPX-20 Classic Anniversary power cord and the Oyaide XLR cable, the bass was better controlled. The Siltech power cord with the Gotham XLR cable made things too smooth and unexciting. So the rest of the listening sessions were done using the Siltech power cord and the Oyaide XLR cable. Another thing I noticed about the E-370 was that there was a dramatic difference in sound quality between the XLR (balanced) and RCA (single-ended) inputs. Through the XLR input, the soundstage was wider, taller and deeper while the singer was projected forward and the dynamics were greater. Through the RCA, the singer was pushed backward amid a smaller soundstage. The sound quality was smoother and less dynamic, but the bass was always better controlled. How much of the differences were due to the different brands of interconnects cannot be discerned as I did not have a WyWires XLR cable to compare with. I actually asked AV Designs (the WyWires distributor) for an XLR pair, but they did not have stock. As for the complete sonic experience, I found the Accuphase E-370 to be fabulous with ballads, slow jazzy numbers and country rock songs. When I played Salena Jones and Jacintha Abisheganaden, they sounded great as the Accuphase’s silky, smooth and rich sound really added much allure to their songs. But when I played Cutting Board Blues (from Cowboy Junkies’ At the End Of Paths Taken CD), the growl and grunt of the distorted electric guitar was a bit subdued. A quick comparison playing a Green Day CD with the resident reference system comprising Lamm preamp and Bryston 4B SST power amp confirmed that the Accuphase E-370 is too refined for rock. So should you buy the Accuphase? It depends on the type of songs that you like. If you have a large stash of Diana Krall CDs, then the Accuphase is for you. Thanks to its AAVA volume control, it sounds detailed even at low volume setting which is just right for late-night listening. But if you are into punk rock, alt rock, death metal, etc, then you should look for a less refined amplifier. However at around RM24,000, the E-370 offers fantastic value for money. 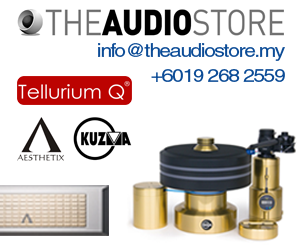 You get a classy sound with top-notch build quality…and two meters that are comparable with those of the McIntosh.